The Philadelphia 76ers and Boston Celtics turn back the clock when they face each other in the Eastern Conference semifinals that begin in Boston Monday night. Bill Russell. Wilt Chamberlain. Larry Bird. Julius Erving. Kevin McHale. Hal Greer. Bob Cousy. Billy Cunningham. 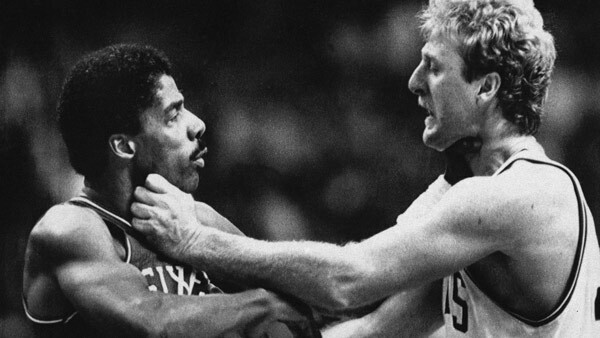 This is the NBA's top rivalry in terms of series played. The teams meet for the 20th time in what has always been the Celtics but also been the Syracuse Nationals/Philadelphia Warriors/Sixers. "They're playing great. Got a great team, great coach," Celtics coach Brad Stevens said after his team eliminated the Milwaukee Bucks Saturday night. I think everybody talks about (Joel) Embiid and (Ben) Simmons and rightfully so, but I think it's ... the skill that they've added to their team and their other young guys getting better; and, obviously (JJ) Redick's presence have just opened everything up. "And they're a bear to play against; you can tell from the last series. I think (coach) Brett (Brown)'s terrific. On down the line. They're terrific." The Sixers, who have waited through years of tanking to get back to respectability, took care of the Miami Heat in five games of the first round and get the latest shot at their long-time rivals. Their fans chanted "We want Boston," during their Game 5 and they have them. Asked Sunday for keys to defeating the Celtics, Sixers coach Brett Brown said, "Just how you're gonna score. ... They're an excellent defensive team. We respect them with what they do defensively and I think they're clever offensively. "They've got the ability to bother you because the team really can shoot 3s." The teams, which first met in the playoffs when the Sixers were the Syracuse Nationals (think Larry Costello), haven't met in the postseason since 2012 and have played twice since 1985. They have tangled just twice in 1985 and the Celtics have won the last three series. Philly's last win came in 1982. The Celtics needed seven games to dispose of Doug Collins' Sixers in 2012. If you want to consider thorns in each other's sides, for Philly it was Boston's Sam Jones while Bird always considered Andrew Toney poison for the Celtics. The Celtics, the No. 2 seed in the East, went 3-1 against the Sixers during the regular season, including Boston erasing a 22-point deficit to win the game in London. Philly's 89-80 victory in the Jan. 18 series finale featured Embiid going off for 26 points, 18 rebounds and six assists. Markelle Fultz, who was "traded" from the Celtics to the Sixers, who accepted Boston's first pick in the draft, did not play against the Celtics in the four games but has since returned. Jaylen Brown, who had two breakout scoring games in the first round, tweaked a hamstring in the first half of Saturday's game. He was pronounced fit to go but Stevens held him out as a precaution. After the game, Brown said, "I'm ready," adding, when asked if he'll go in the opener, "That's my goal." He was slated for an MRI Sunday and Stevens called him doubtful. Boston's Marcus Morris, a Philadelphia native, openly rooted for the Sixers in their first-round series and said Sunday, "If we weren't playing them I'd be rooting for Philly. But I hope we sweep them." The Sixers are the third seed in the conference and are coming off their first series win since 2012.